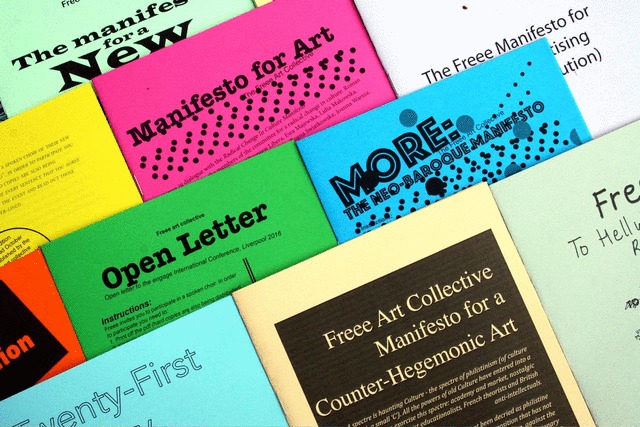 Introduction to the new Freee manifesto - The New Text Art (of) and Making (Books) a Difference by Ulises Carrión Freee An introduction to a manifesto is an opportunity to give an account of oneself. One of the most conspicuous and interesting aspects of any manifesto, in fact, is that it almost always seems to demand or require some kind of defence or account. Why is the manifesto needed? Why now? Whose manifesto is it? What is it against? What is it for? Why a manifesto rather than a poem or a joke? However, unlike in the formats assumed by Judith Butler for ‘giving an account of oneself’, in which the individual faces a demand from a figure of authority, the call to give an account of oneself in the introduction to a manifesto is a declaration to the public. Insofar as every manifesto is a public declaration, every manifesto also calls forth the question: who is the public of this manifesto? Manifestos are not written by the masses but usually by a very small number of people, but they are written in the hope of capturing the anger and dissatisfaction shared by great numbers of people. The public of the manifesto does not always exist prior to its publication, however, since the purpose of the manifesto is to provide a focal point for the construction of a new social body, a new public, a new class, a new social movement. Manifestos contain not individual likes and dislikes; the aim of the manifesto is to identify collective positions and collective actions. A manifesto, from mid 17th century Italian (from manifestare, from Latin) meaning to ‘make public’ (from manifestus ‘obvious’) it is not the act of going to market with your private opinions or personal taste, it is not a disclosing to others what you have done by and for yourself, it is public in a more fundamental sense than this. The manifesto cannot but be public; even before it is published, the manifesto belongs to the public, is formed by the public-to-be, and is addressed to the public (not to readers). That is to say, like a slogan or a political chant at a march, it survives only by being utilized by others. Manifestos and slogans are acts of montage because they cut through the social body in so far as they are ‘carried’ by people and they are continually pasted into other situations. Unlike photomontage, which cuts and pastes images, manifestos and slogans perform what Freee call a real montage of people and spaces. Real montage is a political act of displacement, cutting through reality and reordering the world. 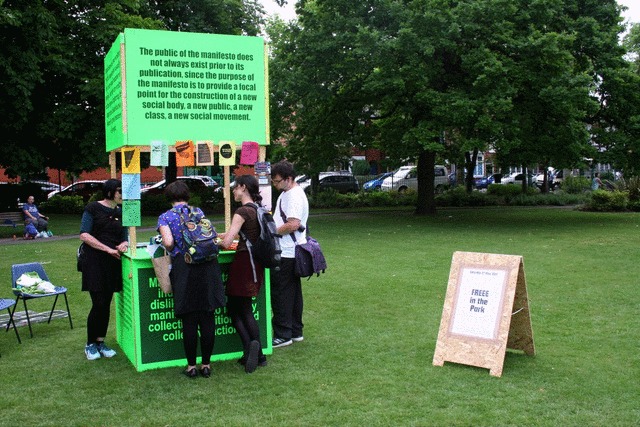 Freee use the genre of the manifesto, like the genre of the slogan, to connect contemporary art after the social turn with a much longer and deeper tradition of collective action and common culture. Manifestos by Freee are examples of text art but they are also a means by which to reunite text with action, and language with politics. 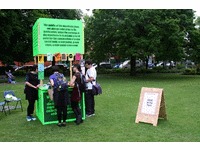 Rather than text art being subject to a giddy range of interpretations, Freee’s manifestos ask the participant (of a spoken choir reading) or the reader (of a manifesto published in a book) to agree or disagree with the statements made in the manifesto. This is why each manifesto is prefaced with guidance on how it is to be used: ‘In order to participate you need to print out the pdf of Freee’s new manifesto and underline every sentence that you agree with. Bring the manifesto with you to the spoken choir event and read out only those sections of the manifesto that you have underlined.’ A manifesto, therefore, does not give an account of oneself, but gives an account of the social and political situation of the time. It is not a description, though: it makes declarations, proclamations, pronouncements, announcements and it sets forward a programme. Manifestos are not performative language in the classic sense: it is not the words themselves that effect change. Manifestos call for action. Language is essential to this transformative activity but it is not the action itself and cannot take its place. Manifestos light the fire but the bodies of the politically engaged are its social agents. In one sense, manifestos do nothing at least not by themselves, but in another sense - in which what we say is tied to what we do - manifestos are essential to the collective action of social change. Beech. D., Hewitt. A., Jordan. M.,(Freee art collective) (2013), Twenty-First Century Political Art: the Freee Manifesto for Art & Twenty-First Century Socialism, in ‘Manifesto Now! Instructions for Performance, Philosophy, Politics’, (eds) Laura Cull & Will Daddario, Bristol: Intellect Books. Beech. D., Hewitt. A., Jordan. M., (Freee art collective) (2014)The Impossible Participant in ‘New Interactive Practices in Contemporary Art’, (ed) Kathryn Brown, London: I.B.Tauris. Beech. D., Hewitt. A., Jordan. M., (Freee art collective) (2015) To Hell with Herbert Read, Anarchist Studies, Volume 23, Number 2. Butler. J.P., (2005) Giving an Account of Oneself, Fordham University Press, Mahony, E., (2014) Locating Simon Critchley’s ‘interstitial distance’ in the practices of The Freee Art Collective and Liberate Tate. pp. 9-30, Art & the Public Sphere Journal Volume 3, Number 1 Wilder. 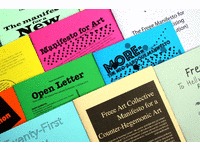 K, (2013) Standing By Their Words: The Manifestos of the Freee Art Collective, in Manifesto Now! Instructions for Performance, Philosophy, Politics, (eds) Laura Cull & Will Daddario, Intellect Books: Bristol.